The Central Ohio Symphony will present its annual Independence Day concert at 7:30 p.m. on Tuesday, July 4 in Phillips Glen, located behind Gray Chapel on the campus of Ohio Wesleyan University. Area residents are invited to celebrate the Fourth of July with the Central Ohio Symphony. 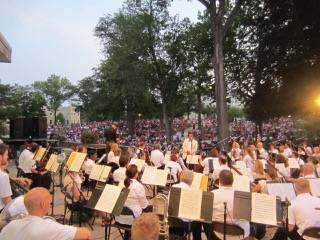 The Symphony will present its annual Independence Day concert for the 32nd consecutive year at 7:30 p.m. on Tuesday, July 4. Conductor Jaime Morales-Matos will direct the orchestra in Phillips Glen, located behind Gray Chapel on the campus of Ohio Wesleyan University on South Sandusky Street in Delaware. Jeanette Ferguson will sing “The Star Spangled Banner” and Delaware Hayes High School principal Ric Stranges will be the evening’s host. The evening’s program will feature music by American composers, including the popular “Armed Forces Salute” in recognition of veterans and active service personnel, and the music from the movie “To Kill A Mockingbird,” by Elmer Bernstein. Hyer pointed out some changes in programming from past years. As has become tradition, the group will perform Tchaikovsky’s “1812 Overture,” replete with theatre cannon blasts. One of Ohio’s largest free orchestra performances, attendance in recent years numbered between 6,000 and 8,000. Concertgoers are encouraged to bring a picnic and chairs or a blanket to enjoy annual event, a July 4 tradition for many families. The Symphony recommends allowing for extra time to get to the concert as there is construction on the Ohio Wesleyan campus this summer. Lawn seating is free. The Symphony also provides limited general admission chair seating in front of the stage for $6. Tickets are available at the Symphony office, located at 24 E. Winter Street in downtown Delaware, as well as at the concert. Tickets may also be purchased online for $6.50. The City of Delaware’s fireworks display will start immediately following the concert. The lead sponsor for this year’s concert is again Willow Brook Christian Communities. Zangmeister Cancer Center, Mt. Carmel Health and Fitness, and Middlefield Bank are also sponsors, as are the City of Delaware and the Ohio Arts Council. The concert location is made possible by Ohio Wesleyan University. For more information on the concert, visit www.centralohiosymphony.org or call the Central Ohio Symphony office at 740-362-1799.
https://www.delgazette.com/wp-content/uploads/sites/40/2017/06/web1_SYMPHONY4TH.jpegThe Central Ohio Symphony will present its annual Independence Day concert at 7:30 p.m. on Tuesday, July 4 in Phillips Glen, located behind Gray Chapel on the campus of Ohio Wesleyan University.